Two are better than one, because they have a good return for their labor: If either of them falls down, one can help the other up. But pity anyone who falls and has no one to help them up. Also, if two lie down together, they will keep warm. But how can one keep warm alone? Though one may be overpowered, two can defend themselves. A cord of three strands is not quickly broken. I’ve been struggling lately. I don’t like to complain, but instead try to find the best of every circumstance. The best in these circumstances has been my hubby, John. He has been my rock. I can’t imagine doing this thing called life without the love and support of such a loyal partner. Life can be tough, but just as scripture tells us, two are better than one. When one is struggling, the other can carry us. When being attacked, two can defend. But wait, what’s this “A cord of three strands is not quickly broken.” Three? These verses are about two, right? Why are we talking about a cord of three in the last sentence? Sure there are two ‘physical’ people in this relationship, but what really gives us strength is that Jesus is at the center of our relationship. There are three of us! When I’m struggling, I tend to be a “Martha” and try hiding from God. John, on the other hand, has amazing faith and reminds me that it is precisely during these times I need to be on my knees and turning it over to God. It is during these times that I see John loving me like Jesus loves his bride. Unconditionally, not concerned about self, and lifting me up. Are you struggling with something? If so, are you letting your spouse and Jesus in or are you trying to take control of it on your own? Is your spouse struggling with something? If so, is there something you can do to help your spouse through the difficulty? Are you praying for him/her? Are you inviting Jesus in? 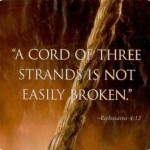 A cord of three strands is stronger! Today, I’m choosing to be loved. My “motto” – for lack of a better word – is “Choose to Love”. I’m very passionate about helping those who are hurting and broken. There is hope! John and I have experienced a lot of trials and tribulations, but through them all God has made us stronger, deepened our faith, and we’ve grown closer together.